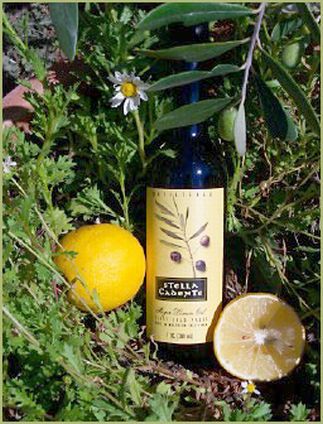 Stella Cadente Meyer lemon olive oil is produced with attention to quality. The Meyer lemons are organically grown & are crushed with late harvest mission olives creating a fragrant Meyer lemon olive oil with a hint of pepper. Enjoy this California-produced crushed Meyer lemon oil with salmon, shell fish, sea bass, grilled vegetables, roasted chicken & much more! Traditionally Italians have celebrated the end of the pressing season by crushing lemons together with the last olives of the harvest year. Please note that this is a "crushed" Meyer lemon olive oil & is not "infused." Most of the Citrus Oils on the market are "infused" & the taste profile is completely different & far less attractive to the taste buds. Stella Cadente follows tradition to insure that this award-winning Meyer Lemon Olive Oil is made in a style consistent with old fashioned methods.